The enjoyment of photography for anyone wishing to become a member has always been at the heart of the club. During our 120 years, photography has continued to evolve. The art of photography is knowing where to point the camera and when to press the shutter. The hard part is knowing what you want to take a picture of, and often why. It makes no difference if it is a family snap, artistic gem, historical record, or social comment, if it is what you wanted to do, then it is ok.
1898, when the club was formed, was an interesting year. Rudolph Diesel patented his internal combustion engine, and Pierre and Marie Curie discovered Radium. Perhaps of more interest to us is the Reverend Hannibal Goodwin. On September 13th, 1898 Hannibal Goodwin was granted a patent applied for eleven years earlier, for the use of celluloid as a base for photographic emulsions in flexible roll film. A system used until the coming of digital at the beginning of the 21st century. 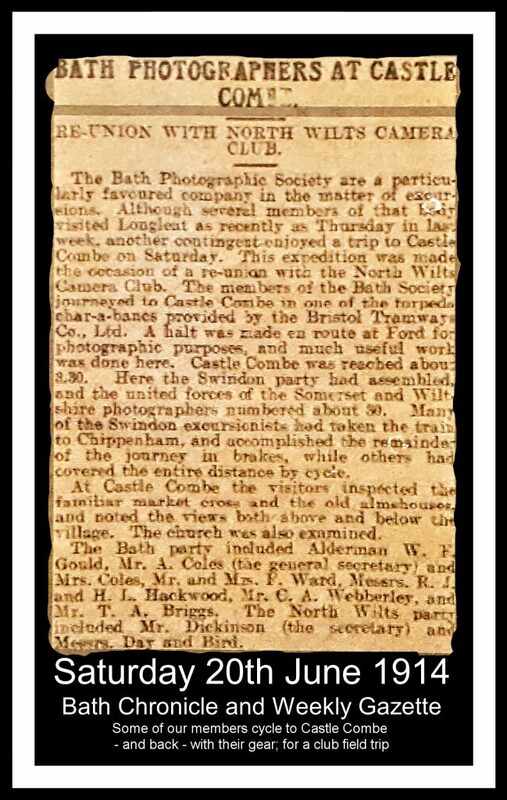 Five months before Reverend Hannibal Goodman got his patent, Swindon Photographic Society held its first meeting. 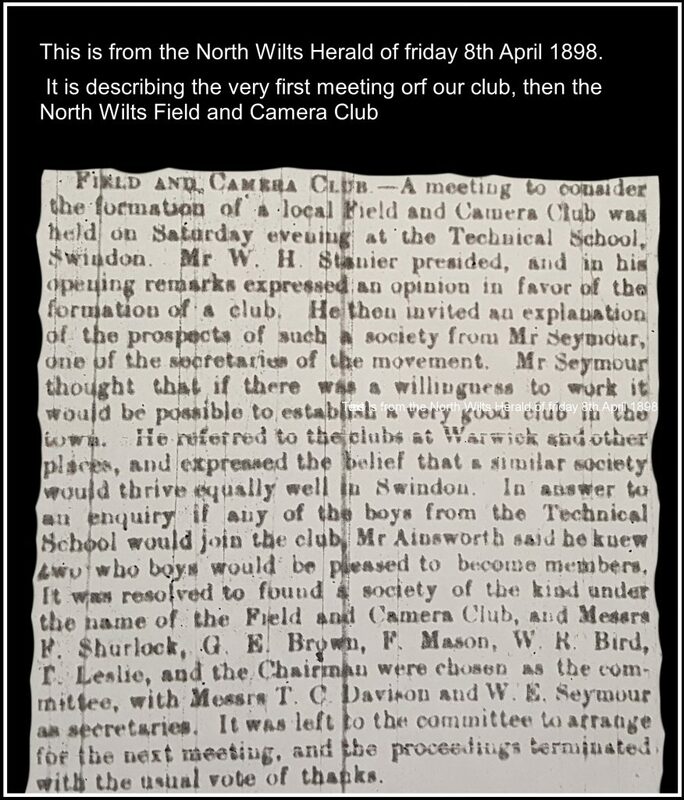 Then it was called “The North Wilts Field and Camera Club.” It was later renamed the Swindon and North Wilts Field and Camera Club, and about 1960 renamed “Swindon Camera Club”. It was not until 2002, nicely into the photographic digital age that we became “Swindon Photographic Society”. At our club’s beginning, members would have been using cameras with glass plates as the medium to record your image on to. Perhaps a few pathfinders would have been using the new paper roll film brought out by Kodak just ten years before. The members would have to wait a few more years to have Hannibal Goodwin’s celluloid film. Throughout our 120 years the club has never stopped changing and adapting to the new situations. We need to be sure we are keeping at the forefront of technical innovations, adjusting to the changing needs of our members, and incorporating new artistic ideas and trends into our schedules. It is of course not only the technical side of photography that has changed but society as well. The field part of the original title was about helping to get members out “into the field” with their big heavy cumbersome cameras. With the main transport systems being horses and steam trains, this was not always that easy. Photography has never stopped evolving; new innovations are always there to change methods of capturing or presenting that special image. Our club was started at about the same time as the first “camera for the Masses” the Kodak Brownie, with the then revolutionary advent of roll film. This was the start of taking photography from the few to the many. Suddenly there were cameras that enabled anyone with no training to take a picture, alongside the more complex cameras used by the keen hobbyists and professionals. Sounds a lot like today doesn’t it, with our Digital Single lens reflex cameras with interchangeable lens alongside smart phones. Once the casual user would send away their film to be developed, while the enthusiast would spend hours in their darkroom producing the prints themselves. First just black and white, then- well the list goes on and on. A steady evolution or a series of revolutions depending on your opinion. 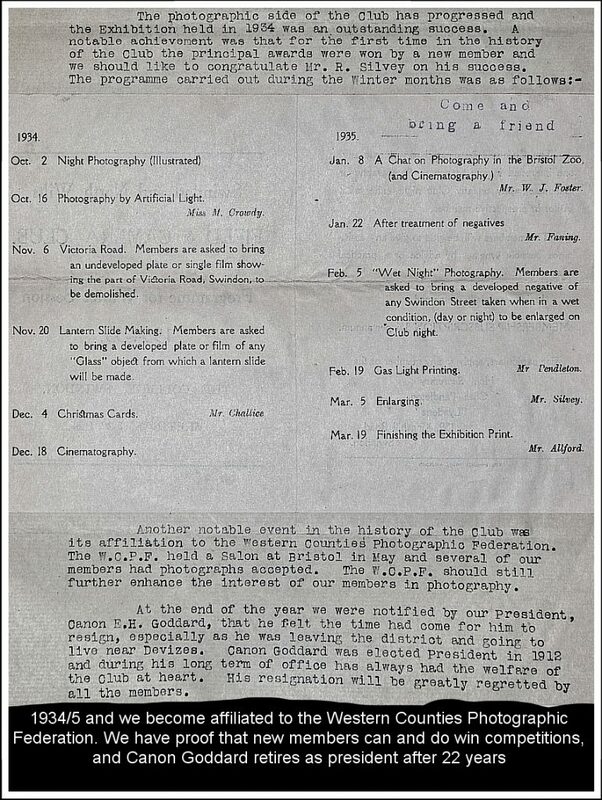 What the club has tried to do during all of this time has never changed; help people enjoy their photography. We do this by providing a place where anyone interested in photography can get together and share technical knowledge and appreciation of the images produced. It works best if we have a wide range from novice to experienced members. At first glance in our old programmes it may appear that the content of our meetings has not altered much. In practice the content of practical information now, is different to that before the internet when precious little technical help was available. Now there are probably several how to videos on You Tube for about every photographic problem you can think of. The sharing and critiquing of images casually or within a competition however still gives the deeper understanding of how to make an image work in the same way it has always done. Also, not everything is as new as you may think. There is a lot of discussion about how digital photography encourages so much manipulation of images that some question it is still photography. The first manipulated images were made in the 1850s. There is talk today of breakthroughs in 3D or stereo photography, but the first stereo images were also about 1850. We have been wondering if we should be innovative in our club today and provide time for movie photography, but the club did this throughout a lot of the 1930s, so not so new. And just in case you were wondering why you have never heard of the Reverend Hannibal Goodwin, he was unfortunately killed in a streetcar accident on the last day of the nineteenth century. But in 1915 the company, Hannibal’s company which still existed, successfully sued Eastman Kodak for the then considerable sum of $5,000.000 for breach of copyright. We have gone from glass plate to digital cameras, and dark rooms to computer screens. We have millions of pixels, and technical capabilities hardly dreamed of ten years ago. While everyone has an endless supply of information at their fingertips, and all carry a camera in their phone in their pocket. To assist and encourage the enjoyment of photography.